I am currently on the Massy Arias 30 day challenge. I really like the program and some of the meals. However, I do customize the meals to my specific dietary needs. 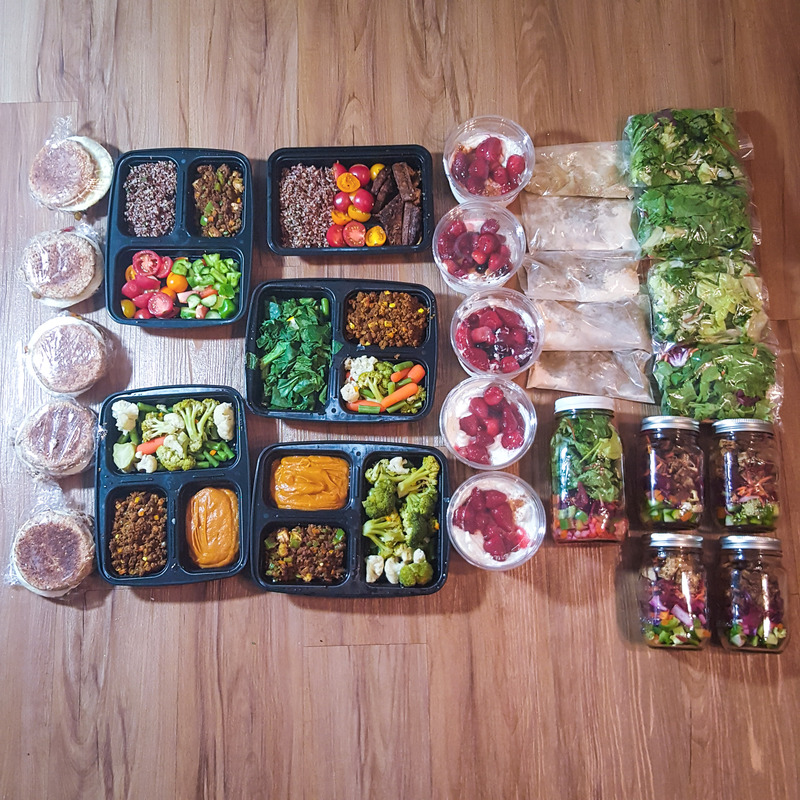 This week, I wanted to share my vegetarian meal prep for this week. In less than 90 minutes and $80 dollars, I was able to make all my meals for the week. I purchased all items at Trader Joe’s with the exception of Beyond Meat. You can find Beyond Meat items at Whole Foods, Central Market or at your nearest grocery store by clicking here. Take a look below for details of my easy and affordable vegetarian meal prep. I workout in the morning so I normally eat breakfast in the car. I make homemade egg sandwich with Ezekiel English muffins, egg whites and sauteed onions and peppers. I get bored with eating the same things every day so I have two options for lunch. Using one bag of Beyond Meat crumbles/grounds, I season two different ways. Any additional meat I have left over my the salads, I also use as well. Meal option 1: Sweet potato smash, mixed vegetables and seasoned Beyond Meat with curry and chopped veggies. Meal option 2: Lettuce wraps using seasoned with ginger and coconut aminos and chopped veggies, cilantro quinoa and tomatoes. Similar recipes for lettuce wraps can be found here. Currently fresh berries are expensive, thus I purchased frozen organic berries instead. I use Fage 2% yogurt and added stevia and cinnamon for flavor. This week Massy has us making a green smoothie for our snack but unfortunately I can’t do it at work. As an alternative, I am making my “green” travel smoothie. I use Garden of Life Raw chocolate and Plant Fusion vanilla with almond milk or purified water in a blender bottle. I love mason jar salads. My mason jar salads include with variety of chopped vegetables, steamed beets, mixed greens and Beyond Meat beast burger or chicken strips. I used bbq seasoning for the beast burgers and trader joe’s chicken seasoning rub for the chicken strips. I also use the taller mason jars when I am on the go. That’s it! I am loving this weekly meal prep as I am getting faster each week and more focused. Once I clean up my kitchen, I prep my workout and office clothes for the week too! It has helped keep me focused and saves me time. PS: The containers I am using for meal prep can be found at my amazon store or by clicking here. This is a great guide! Thank you for sharing. I’m still struggling with the final leap to go vegetarian. I meal prep weekly, eat clean and workout 4/5 times a week but I think if I let meat go I can get myself to the next level in my overall health. I feel sluggish and tired after eating meat and I don’t crave it as much. I’m going to use this guide to help jump start my journey! no problem! :-) Join in with us for the new year as we go vegetarian for 30 days. Meal prep containers! How cute. Once I run these old Chinese take-out containers down, I will invest! can you reheat the beyond meat meals?